Fenced rates let you offer different rates for your itineraries, based on the end-user's device and country, or whether the end-user is signed in to their Google account. A special kind of fenced rate, a qualified rate, can indicate lower rates are available if the user signs up for a loyalty program. You can set up and use some fenced rates without contacting your Technical Account Manager (TAM). In particular, qualified rates require that you work with your TAM to set up and use them. Key Point: When a partner has more than one rate (Public or Fenced) for an itinerary or a Room Bundle, the user will see the lowest rate. Note: Google will always pick the best rate for which the user is eligible. Rate Rule Definition file: Define the conditions in which the fenced rates are applied. Price feed: Use the <Rate> element in a Transaction message to set the rates. Points of Sale file: Add rate-rule specific values to your deep links. 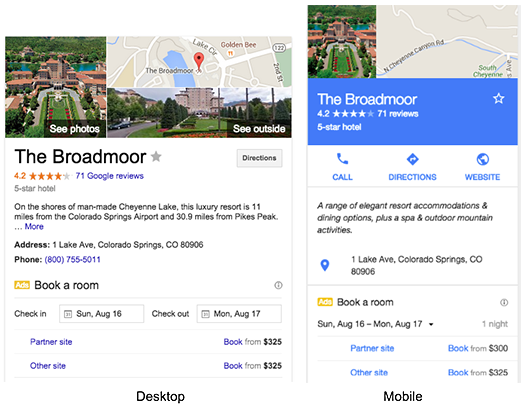 Device-specific rates are hotel rates that are only visible to and bookable by users on a specific device: mobile, tablet, or desktop. The rates are provided by our partners; end-users can see and book the same device-specific rates on the partner’s site. Note that tablet users are eligible for desktop rates. Country-specific rates are hotel rates that are only visible to and bookable by users who are searching for hotels from a specific country. Google determines the country by looking at the end-user's IP address. The rates are provided by Google's partners and users can see and book the same country-specific rates on the partner’s own country-specific site. Note: The Price Accuracy Policy ensures that the rate a user sees in the search results must be available for the user after they click through to book the rate. Signed-in rates are visible only to users who have signed in with a Google account. The rates are provided by Google's partners, and users can see and book the rates on the partner’s own site. You define rate rules for fenced rates using a Rate Rule Definition file, and send them via email to your Technical Account Manager (TAM). This section describes how to create a Rate Rule Definition file in XML. You can also do this with the Hotel Ads Center, as described in Fenced Rates. The root element of a Rate Rule Definition file is the <PrivateRates> element. Within this element, a Rate Rule Definition file requires one or more <RateRule> child elements that define the individual rules. Each <RateRule> child element requires an id attribute, as well as child elements that define the rule itself. Note: The character limit for rate_rule_id (attribute of <Rate>) and id (attribute of <RateRule>) is 40. <Description> Optional Describes the rate rule. <UserRateCondition> Required Contains the filters that define the constraints of your rate rule. This element must contain at least one type of rule (either <UserCountry>, <UserDeviceType>, or <UserSignedIn>). "all": Include end-users that match all of the conditions defined by this rate rule. "any": Include end-users that match any of the conditions defined by this rate rule. "none": Exclude end-users that match any of the conditions defined by this rate rule. The <UserRateCondition> element is recursive and can be combined to specify multiple AND/OR conditions for your rate rule. <UserCountry> Optional Specifies the two-letter country code (ISO 3166-1 alpha-2) for this rate rule's country condition. For example, "US" or "DE". Google determines the end-user's country by looking at their IP address. <UserSignedIn> Optional A boolean that specifies whether or not the user must be signed in to their Google account for this rate rule. A value of "true" indicates that the user must be signed in. A value of "false" indicates that the user must not be signed in. If you don't care whether the user is signed in or out, do not include a <UserSignedIn> condition. For qualified rates, no Rate Rule Definition file is required. Conditions for qualified rates are configured by your Technical Account Manager (TAM). The following examples show various ways to define fenced rates. Note: When specifying multiple country codes, the op="all" attribute doesn't make sense as a user can't search from both country domains. In this case the op="all" attribute is treated as op="any". You set fenced rates in a similar way to other rates: using the element in a Transaction message. The <Rate> element may be used as a repeated child of <Rates> within the <RoomBundle> or <Result> elements. For it to be a fenced rate, you must set the value of the rate_rule_id attribute which matches the rate rule ID that you defined in the Rate Rule Definition file. If you do not have a default public double occupancy rate, then set the <Baserate> child element of the <Result> message to -1. Any fenced <Rates> that are sent to us in this case will be considered valid. To ensure that eligible end-users can book the discounted rate through a deep link, you might be required to modify your Points of Sale file There may be additional implementation needed on the booking website to properly fulfill the discounted rates so that when the user clicks through, your website shows them the discounted rate. We expect you to honor the price shown at the fenced rate deep link. In a dynamic deep link, you can include the rate rule by its name (the id attribute of the <RateRule> element) with the RATE-RULE-ID variable. This example chooses between two landing pages, depending on whether the rate rule ID is set. For more information, see Dynamic URLs. Last updated February 28, 2019.